This is one of my all time favorite meals, hands down. I'm not sure if it's because it's nostalgic, or because it's so darn good, probably both. The whole family loves this meal. One of the nice things about this Japanese dish is that all the ingredients you can get at normal stores, which makes it a little less intimidating for someone who wants to try a Japanese dish for the first time. I hope you love it as much as we did. Here are some helpful side notes about some of the ingredients. If your store has a good quality beef roast on sale for a great price, I'll usually buy that. Take your meat to the meat department in your grocery store and ask them to slice it thinly for you, this will save you A LOT of time and hassle and most store will do it for free, so why not!?! The bean threads, I think I was able to find at Walmart with the other Asian foods, they are dried, white/clear noodles. You can also check your local grocery stores, but mine didn't carry them. Follow the directions on the back of the package on softening them, which consists of covering them with boiling water and letting them sit. Mine came in a three pack tray of noodles, which is way more than we need for our family of 5. This last time I just cut one of the dry bundles of noodles and used that, and it worked and I stored the rest of the dry noodles in a ziplock for another use. Some of us in our house like the noodles more than others, so for us I think next time I'll use one of the three bundles instead of a half, so I can get my noodle fix. Also this is more of a technique than a recipe, the only recipe is really for the sauce that the ingredients are cooked in, you are more than welcome to try your own mix of veggies or other things that you like. In a large deep pan, combine ingredients for the sauce and bring to a simmer and make sure the sugar is melted. Add the other ingredients in based on cooking time, making sure the sauce comes back to a boil. I like to add the meat, noodles (so they can soak up the flavor of the sauce), carrot and other firm veggies first. Once they have cooked for a couple minutes I'll add the rest and let them cook until the meat is done and cooked through. It shouldn't take the meat too long to cook since it is cut so thin. Stir the ingredients occasionally so they all get cooked evenly. I like to throw the green onions in close to the end so they don't loose their color and get limp. 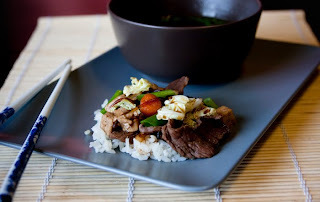 Used a slotted spoon or something to get out your cooked ingredients so you don't get too much sauce and serve over rice, you can always use a spoon to get a little more sauce to put with your rice. 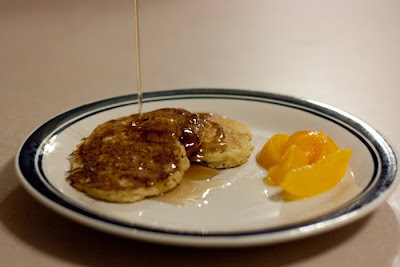 This is a recipe we have made several times, and we love it. This last time I forgot get mushrooms, so we made it without and was still equally good. 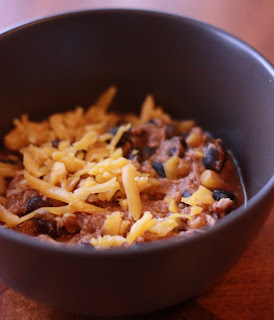 I came across this recipe on a food blog I enjoy, this lady used her crockpot every day for a year. 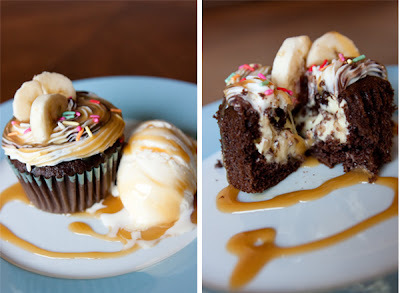 There are quiet a few recipes I've found on here that are still waiting to be made, I go here often, go check her out. For those that we have made this for we had a few changes from the above recipe. Add one cup chicken broth, 1 dried hot pepper whole (taken out before eating), and half the beans. Combine oats and buttermilk in a bowl, cover and let sit in the fridge overnight. Add eggs and butter to the oat mixture. Stir in dry ingredients. These were super yummy. We have made them several times and you should too! 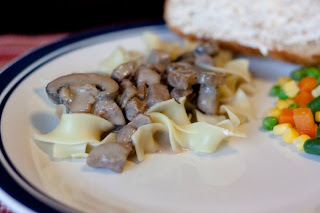 Combine meat, soup mix, cream of mushroom soup, beef consumme, and mushrooms in crockpot. Turn on low and let cook 4-6 hours depending on the size of meat. My new crockpot has the option of setting the amount of time it cooks for and once it hits that time it goes to warm. If you don't have this option you can start it in the morning and just let it go until you are ready to eat. A half an hour before you eat, or if you don't have that amount of time when you start getting water ready for your noodles, add the sour cream. Serve over egg noodles. Well today is my sister-in-laws birthday (Happy Birthday Miss). So I am going to use that as an excuse to talk about birthday cakes. I know everyone loves some sort of birthday cake. It might be a great chocolate cake or maybe it is a white cake with lemon frosting. But I think that all of us can remember the great cakes that our mom's made for us when we were kids. I know I remember how much effort my mother put into making sure our cakes were perfect. Around here Erin does that for our kids. I thought we should do a little review. Here is a great cake She made this last year for Stirfry. 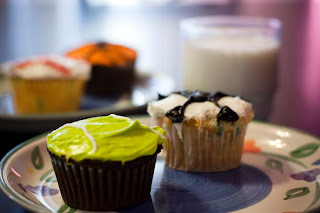 I think we were on a cupcake kick this last year, so you can see the awesome ball cupcakes she put together. The amazing attention to detail and how much work she put into them. 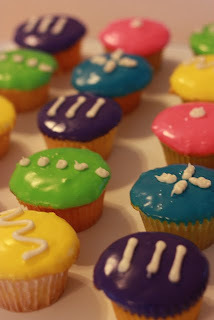 Here is buluga's stunning elegant yet simple cupcakes. They turned out so perfect and were pretty good to boot. I think we should make some more. Lastly we have Speedy's. 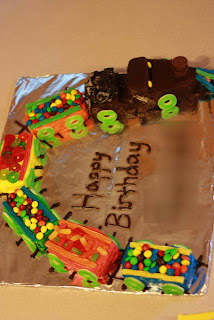 She went all out with this train cake. It was impressive. She put so much work into something that was just eaten. This brings me to my last cake. The other night Speedy was eating with us at the table. 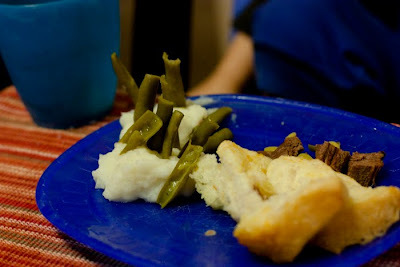 You know the Sunday dinners that you mom or wife puts all the effort into. Getting up at the crack of dawn to sear the roast. Then puts it into the crock pot for hours on end to make a simple piece of meat tender as butter. Then slave over a stove for hours making the most delicate mash potatoes. Then puts some greens in for good measure. That was our night. About half way into it we saw that Speedy was doing a little something with his dinner. When asked what he was doing his response was, "Its my birthday. I'm making cake." So here you go. How not to make birthday cake. So last week I talked about how to save money on your food budget by using coupons. If you missed it or need a refresher go here. This week I'm going to talk about my ALL TIME favorite website! It's called grocery smarts. It list local stores and what they have on sale. They give the items on sale a star rating, 1 being the worst and 5 stars being the best price you'll probably ever see for that item. You need your states code, that you enter on the right side under "enter a passport". Here are some state codes that I know... Utah is g84ctm or g84cem, Arizona g85ro1, Eastern Washington g99ro1, Idaho g83ro1, Nevada/Las Vegas Area g89cjm, Nevada g89csb, Southern California g92ro1. If you don't find where you live on here go to Pinching Your Pennies and go to State Forums and go to your state and see if you can find your local store ad listed. Both of these sites are great resources when it comes to shopping. Often times I have a hard time remembering what is a good deal for things. Grocery Smarts tells you on their star scale how good of price it is, and it'll tell you where you can find coupons for those products either online or in newspapers. If there is a coupon listed the star rate is based on the price after the coupon is used. So how do I use this website? I go on and see what the great deals are and try to plan my menu around that. Or if I know I am almost out of something and it goes on sale for a great price, I stock up, so when I do need it I don't have to pay full price. Did you know that sometimes stores list things in their ad to make you think they are sale and they really aren't on sale or that great of a price? So go check out my favorite site and see what is on sale for an unbeatable price at the store near you!